What a fantastic start to my trip to Chicago. Of course, like everyone else I have wonderful kids. I go to Dallas frequently since my oldest daughter has a condo there. It is always so much fun to experience the vitality of a large city and she lives in a great area for getting around. 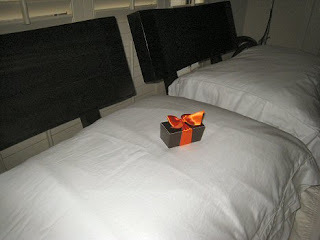 When I took my stuff in and put my overnight case in my room….there was a beautiful chocolate box with a ribbon on it on my pillow. She was out of town but took extra trouble to make her mom feel good…I’m gonna cry. Well…………let me tell you, there is nothing like getting together with other artists to stoke the creative fires! And I am feeling SO GOOD…………although I have to admit it doesn’t take too much to make me feel good. Someone (galleries) saying they love my work,hanging it, and I hope, selling it will make me feel a mile high, talking with friends, eating good food with a couple of glasses of wine…that will do it for me. With all this said…I’m coming back from a 4 day trip to Dallas to move work to a new gallery, Artizen Fine Arts, taking an encaustic workshop north of the area where I will be staying/visiting with my daughter and an artist friend or two joining us………all at the same time.